Discus Fish is the native of the Amazon river and they thrive in hard water between 7 to 10dGH with slightly acidic environment. They are very shy and docile fish, which are best kept with their own species in an aquarium tank and a recommended setup should have a bare bottom so that it is easier later part to breed them. Today, most home aquarium discus is no longer wild variant but instead, they are tank bred to produce different species with desirable characteristic. Some of the common species are Red Phoenix, Blue Turquoise, and Pigeon Blood. Discus is very particular about the surrounding water. Not only must it be suitable with the correct hardness level, but the temperature should also be higher close to 30degC and that is probably another reason why other tropical fish cannot be mixed with them in a community tank. This requirement is very important and if not met, the fish will become susceptible to disease especially ich and you will notice they will start to have lower appetite. Understanding their needs is the key to successful discus fish keeping and sometimes you will need more than just knowledge and experience, but patience is also equally important. Discus grows very fast provided that they are fed with nutritious live foods and quality fish food. They are especially fond of bloodworms and they will reach full-grown size and body thickness by the time they are 9 months old. Once they reach that age, they will start to find partners and form a pair, hanging out together. That is the time, that you should isolate the rest of the discus or you can choose to leave the mating pair alone in the current aquarium tank. 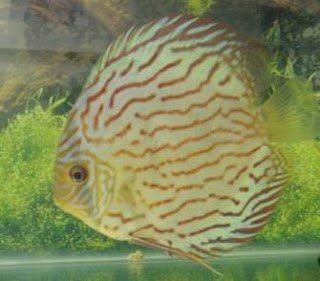 Female discus usually lay her eggs sticking onto aquarium side surface and the male will release the sperm to fertilize it. In a matter of 48 hours, the eggs will hatch and the fry will remain on the same spot clinging to the surface for another 12 hours before the parents will start to move them to another location to hide them. In about 1 week, the fry will become free swimming and will start to feed off the slime coat on their parents’ body. It will be another 3 weeks before they become independent. Don’t be surprised if there’s hiccup and the whole process does not go smoothly as it was meant to be because young discus pairs usually failed in their first few attempts. So far, based on my own experience, keeping the fish in a 30-gallon tank somehow is not suitable because what I noticed is that somehow the tank size will limit the growth of the discus fish and they will not become fully developed. As such my recommendation is definitely 50-gallon fish tank minimum to ensure they thrive well. Needless for me to say that, other that having best aquarium size, maintenance especially regular water changes is also a top priority. Related topic: Find out more about preparing and conditioning aquarium water for your discus fish.